The mighty Common Eider, King Eider return; with much anticipation just as they are smoldering their way through the European Underground on tour. Here in total ghost mode, this music is truly beautiful andhaunting. Hushed vocals and sparse electronics dominate the four tracks. The sound that emanates from the skeletal remains of the dark ambient, dark folk, and doom metal genres. Gold offset printing on red metallic stock. 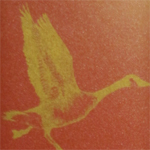 Standard 2-panel j-card with a six page lyric booklet that is hand inscribed with the Common Eider King Eider logo on the front in gold metallic ink by Rob Fisk. Packaged inside a red velvet bag, with a red tipped pheasant feather. 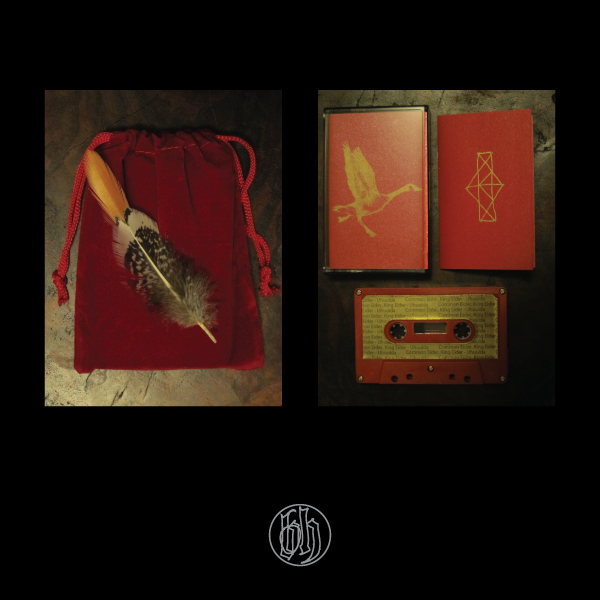 Limited to 200 copies on red tapes with gold labels. Split label release with Cloister Recordings.